Assalamualaikum, I'm Ghaida and I come from Bandung, Indonesia. I'm a 21 year old student (I'm studying for a bachelors degree in Physics), and I am married and expecting a baby soon InshaAllah. I am a business woman, fashion designer and the owner of the boutique GDa'S Gallery. Physics is my favourite science, but fashion is my hobby and I love everything about creativity, colour and style. I love to make designs for casual dresses, skirts and wedding gowns (for me and my customers) and most of my clothes are designed by myself. I get really happy when I see hijabis looking fashionable but still modest. I like experimenting. I always try to look different day by day. Actually I don't have a fixed style - it might be vintage or classic, but it depends on my mind, mood and inspiration. My inspiration comes from everything, for example when I am browsing the Internet, blogwalking, or even just when I meet a grandmother at the supermarket. I love to observe and watch how people style themselves and it can also be my inspiration. I like mixing and matching colours. Usually, my style consists of 2 or 3 colours, my favourite being pink. But I never wear the same colour head-to-toe, it's too matchy-matchy. I also love doing DIY projects. So, if I look at my old clothes, and I'm not interested in wearing them anymore, I try to remake them for a different look. For example we can add some new details or accessories, or just cut randomly as we want, we don't have to be a professional tailor to do that. You just need some sewing skills, and it's really fun! So, to get the best style, we don't have to buy any new clothes, but we can remake old ones. And also, it can encourage us to be more creative day by day. My favourite clothes are dresses and skirts! I try to always wear them for every occasion. I like being cute, girly and feminine. I love to wear a clothes in different way, such as wearing a skirt as a dress, wearing hijab as a scarf, and many more! I also really appreciate handmade things which are limited edition. I don't mind if the price is quite expensive, because I imagine how long it took to make it by hand, and I think the producer deserves it. I always try to wear the most comfortable clothes, with the weather, season and occasion being my considerations. So our homework is how to be stylish yet wear comfy clothes. Making over our old clothes is a good way for us to save money, increase our creativity and get a different new look! It's really good if someone can inspire us, but never let us be exactly like them! When you go to a store, it's be better to invest in simple clothes first. If I have a lot of simple items, then I go to the next step: don't be afraid to buy unique, colourful, modest clothes. Just believe when you go home, you can mix and match it and make a great style! The key to style is: be confident but don't be arrogant. Remember that style is not everything, it's just a way to express ourselves. Stay fashionable but modest! this is probably the CUTEST hijab style so far! I love the colors! Salam sister, your very inspirational and a great model for today's Muslim women. Keep up the great work! May Allah protect and bless you with your child! AW, her style is so cute! Oh Ghaida, I heart her style, I visit her blog regularly..
She represents the young, lovely, fashionable, yet modest and covered style.. I notice that she always has her hijab long enough at the front to cover the chest.. which to some stylish hijabis this has been abandoned..
You, my dear, have a great style. Ilove the way you create and re-create you items. I am definately gonna try and do it, once i learn how to stitch LOL! Her style is really suitable for ypung Muslimah. Very sweet n sassy! Alhamdulillah.. thank you Janaaa ^^ i'm on hijabstyle! hihihi..
i really like the middle 2nd row pic! you inspired me to redesign my old clothes! Ghaida! I absolutely adore your outfits...amazing! 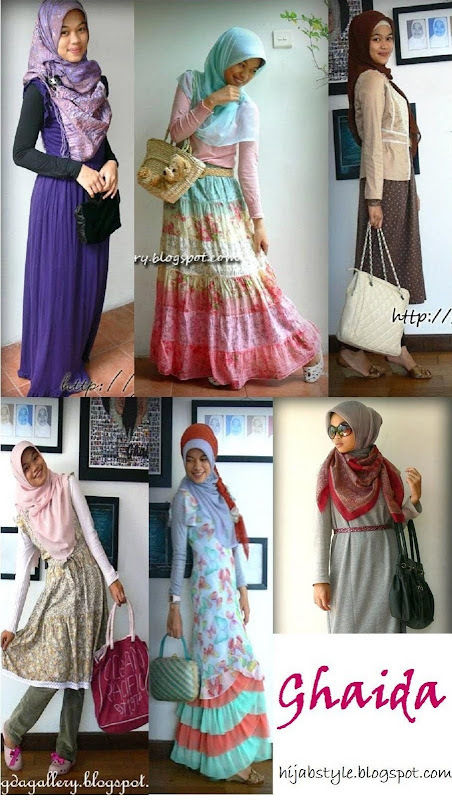 I want that multi coloured/tiered skirt in pic 2 - where can i buy it from?! and i cant believe you have achieved so much and youre ONLY 21, mA! good luck with the baby-iA. I will be reading your blog from now onwards! I feel compelled to write a comment for this post, since I like so much the pictures presented. In any case, it's my very favourite style presented on this blog so far. i love her style. it is fashionable and modest. am inspired with her style, will visit her blog to read more about her. Allah bless her n her comin Baby n whole family. Inshaallah. Very beautiful Masha'Allah - definitely bookmarking that blog! i really love her clothes in pictures 3, 5 and 6! ooh i like her style soo much! salaam sis awwwwww u are soo cute and beautiful:D i like ur style!! mashAllah keep it up!! May Allah grant u all the best inshallaH! Super cute and feminine! Very well dress in all the pics! I like you way of wearing the hijab, it looks nice and covered. May ALLAH give you a healthy and beautifull baby! i'm from malaysia n just found ghaida's blog.